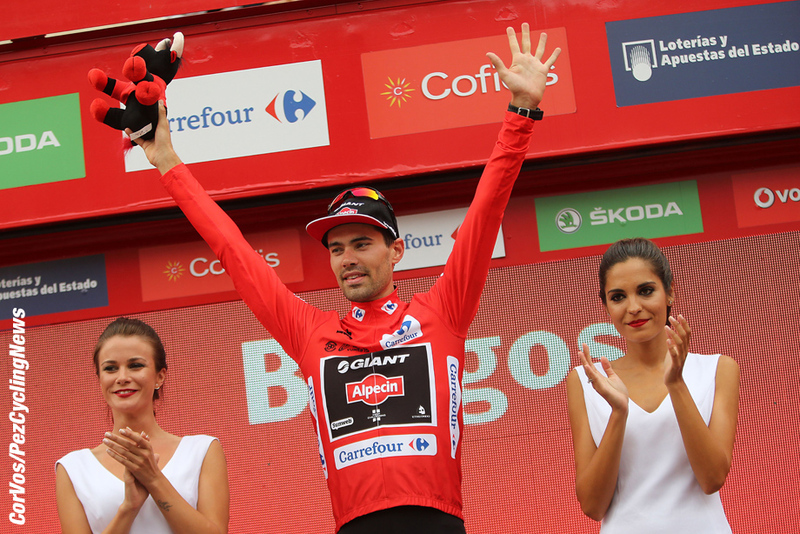 PezCycling News - What's Cool In Road Cycling : Vuelta’15 St.17: Dumoulin Dominates In Burgos! Vuelta’15 St.17: Dumoulin Dominates In Burgos! Race Report: On a Burgos time test parcours for the big, strong men it was Netherlands Giant, Tom Dumoulin who was biggest and strongest to take the stage by a minute plus from Tinkoff-Saxo’s Pole, Maciej Bodnar; the Dutchman also grabbed the red jersey of leadership from home boy Joaquim Rodriguez (Katusha). Rodriguez was eaten alive by the Dutchman, dropping three minutes plus - but on GC he’s still only @ 1:15, too little to right the wee man off. And more menacingly, Astana’s former race leader Sardinian Fabio Aru is only a scant three seconds back on GC. Maciej ‘The Bison’ Bodnar (Tinkoff-Saxo & Poland) was leader as the ‘Bigs’ mounted the start ramp, stage right – it’s all that good grass from the Polish Plains that makes Bodnar so strong. Domenico Pozzovivo (AG2R-La Mondiale & Italy) drops off the ramp, if only he didn’t look like a factory worker pedalling off to start the back shift. Alejandro Valverde (Movistar & Spain) is a former Spanish Time Trial Champion and next to go in the race of truth – he should hold his own. Louis Meintjes (MTN-Qhubeka & RSA) is too light to be a chronoman but ‘what cannot be cured must be endured’ as the skinny man heads off in forlorn pursuit of Valverde. Nairo Quintana (Movistar & Colombia) will be hoping for no repetition of last year’s Vuelta Time Trial where he did his stunt man act, bouncing down the Iberian tar like a rag doll on a bend. Dani Moreno (Katusha & Spain) is next to big cheers – all the home boys get that – not renowned as a tester but when it’s ‘for real’ in his home Grand Tour he’ll did deep. Race revelation Esteban Chaves (Orica-GreenEDGE & Colombia) is another man without the body shape to be an ‘elbow bender’ as the English roadmen used to call the time trial riders back in the 70’s. Mikel Nieve (Sky and Spain) is on the road but next is the man we’re all waiting for; ‘Big Tam’ – as they might say in Glasgow – Dumoulin (Giant-Alpecin & The Netherlands). No national champion’s skinsuit - he was tired at the champs after his Tour de Suisse exertions – but he’s straight into it, flat back, stroking it smooth and big. If it’s down to looks and style, he’s the winner. Rafa Majka (Tinkoff-Saxo & Poland) is next, not a bad tester despite his light build; he could do a lot to cement a podium today. Fabio Aru (Astana & Italy), the last time we saw him in a big chrono was in the Giro when, for a minute or two he looked like he may be DNF, so much did he struggle. Last man, Joaquim Rodriguez (Katusha & Spain) isn’t perhaps as poor against the watch as folks make out – when he lost that Giro to Hesjedal the big Canadian was on the ragged edge to beat him. OK, they’re all on the road now and the camera goes to Dumoulin as if drawn by a magnet – smooth and not as high geared as a Tony Martin, he looks every inch the consummate chronoman. Majka’s position isn’t the best, but it’s hard for a small guy to look good on a TT bike – getting low at the front is difficult given the UCi rules. Rodriguez isn’t messing, the gear is big but there’s body movement and every roll of the shoulders catches the air and costs watts – as with Majka it’s hard for him to get low enough on the bars. Aru’s back is flat but there’s a lot of torso movement as they roll through the scrub with not a picnic or old guy with his dog in sight. Dumoulin goes top at check one, 14K – he does look magnificent on that Trinity with his body still and long shanks whirling those long cranks, clipping the corners but riding the straights ‘Anquetil Style’ on the crown to keep clear of the flints and grit. Majka drops a minute to Dumoulin, Aru 44 seconds, Rodriguez looses 1:11 – ouch! Check two and Dumoulin is on 52 kph; his aero helmet runs seamlessly into his spine – there’s wind tunnel time at work there. Majka isn’t enjoying it, his legs are heavy, chugging the gear round and 2:11 down on the BiG Dutchman – it’s a rout ! Valverde is almost home, just four seconds shy of Bodnar – a nice ride for the Murcian. Dumoulin continues to fly, kissing kerbs, hardly freewheeling at all as Aru drops 1:44 on him. It drags, we have fans roadside, they cheer, Dumoulin dances – meanwhiles, back at the ranch it’s Quintana, not a bad ride at all, fifth @ 29 seconds – solid. Rodriguez hits check two – 2:38 is the deficit, ‘sore one’ as the Scottish football commentators might say. Majka drinks, rocks, rolls, moves from one side of the road to the other – it’s a bad day for the Pole. Aru is on a huge gear, too big, he changes down – that looks better and he’s cornering well, too. Majka on the climb, he looks better against gravity than on those long, grim straights which Bisons like Bodnar and Bears like Dumoulin thrive upon. Chaves comes home @ 1:39 on Bodnar, not great but no disaster. Dumoulin is back in Burgos, flying through the corners like a Kermis King; 46:01 at the line – brilliant, a minute and more clear of Bodnar. Nieve lurches home, he drops 3:29 to Dumoulin as Majka fights the pain and the big gear into Burgos. Rodriguez climbs, the crowd go crazy but it’s a disastrous day for the little Catalan. Still Majka isn’t home, those barriers go on for ever. . . 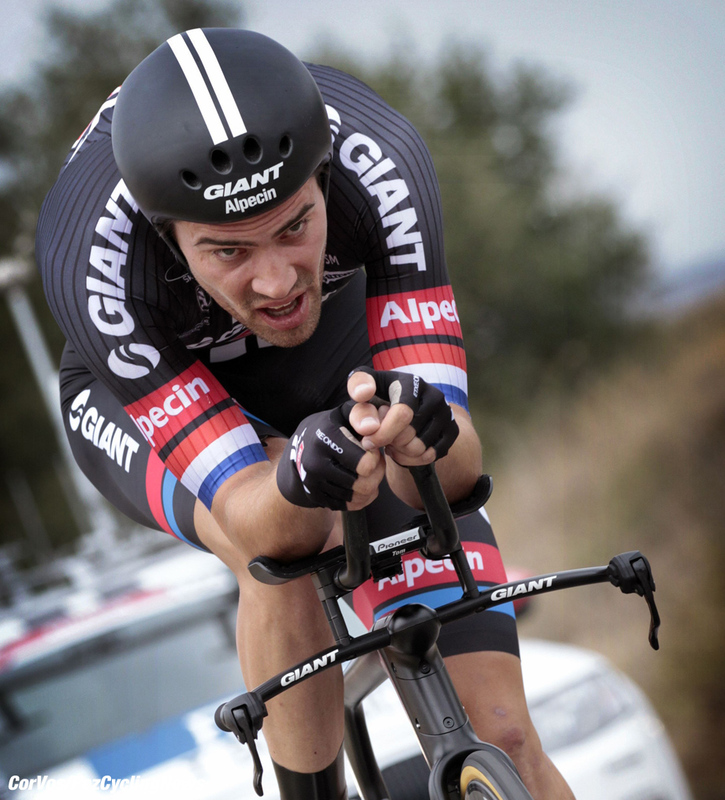 The gap is 2:38 on Dumoulin – ‘nuff said. Aru is in town, he looks better than Majka, diving into the corners and poking a big one home – 1:53, not great but not as bad as it could have been. Just Rodriguez to come; he’s still a long way from home as the crowd try to carry him home through the tree lined boulevards of Burgos – three minutes plus is the yawning gap. Dumoulin wins and takes red but with three tough stages to come this race is by no means over with skinny Sardinian, Aru just three seconds back and still backed by his Astana mountain bandits, whilst Flatlander Dumoulin will be a lonely boy in those barren Iberian mountains still to come. . .
Can 'Big Tom' hold the jersey to Madrid? Just be glad PEZ will be there to take you all the way to Madrid. . .
25. Maxime Monfort (Bel) Lotto Soudal at 2:52.